We are at the Hamilton Boat Show this week so we are sending the newsletter out early. It is too early in the week to forecast what the weather will do in the weekend so I have a new weather site for you to look at. I have usually found this site to be the most accurate in it's interpretation of what the weather will do in the next 72 hours than other weather sites. It does not give an actual forecast but shows the isobars and wind direction over the whole country. The weather maps can be viewed in six hour increments. Visit the Paul's Fishing Kites team at the Hamilton Boat Show at Mystery Creek from Thursday August 29 through until Sunday September 1. Come and see our full range of Kitefishing Rigs, Kites, Boat Longlines, Target Hooks and spare parts or have a chat with the experts. We will have all the gear you need to get you kitefishing this season at the show. Check out our Show Specials. As promised here is a brief report and some photos from Mokau. Today I am presently taking shelter from the inclement weather. The sea is reasonably flat, so next time we have an offshore wind I will be out there fishing hard. The snapper on newsprint was a big one I caught three months ago. 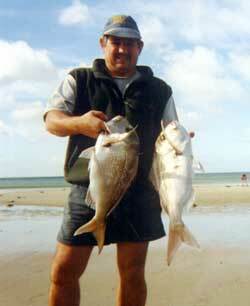 I posted the photo to New Plymouth for a fortnightly fishing photo competition and won a $50.00 voucher. 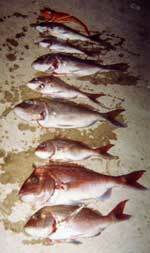 I caught four snapper over 20lb in a fourteen day period on my kite rig. Geoff with his 25.9lb snapper caught using a Kite powered Bottom Longline. The two huge snapper in this pic were caught straight out from where I am standing. The sea that day was dead flat with an early morning offshore wind. I left the line set for 2.5 hours. 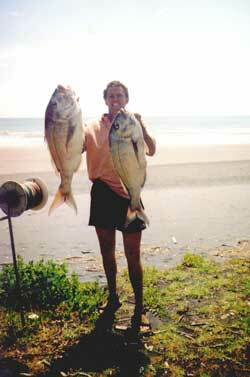 Me on the beach at Mokau with two snapper. One weighed 23.5 pound and the other 19.5 pound. This is looking down from the ledge where I normally fish. It is a near full house of gurnard coming in. It is quite common to load up on gurnard and have no other species. Then the next set you haul in will be all snapper. It is such a good spot and you never know what you will get. During summer some of the more unusual fish I caught were two thresher sharks, a hammerhead, eagle rays and one 14kg kingfish that took a strip of squid I was using for bait. 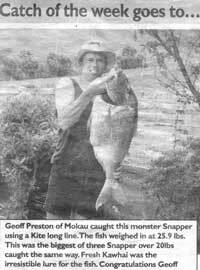 When I am on my own it can be a real mission to land the fish, as the big snapper are moving all over the place in the swells. It is also a little dangerous! If there is two of us out fishing it is very easy, one person guides the fish over the net using the mainline. I have learnt to be more patient when fishing this spot as I have lost three monster snapper in the past. On one occasion I didn't have a landing net. The other times I was so excited I tried bringing the fish in too quickly. One fish snapped the hook, the other straightened out a commercial longline hook. Because you are bringing them in from a height it puts a lot more stress on the trace and hooks. Chris is a good fishing mate of mine who purchased a Bottom Longline Rig. This was only the third time out using his kite, needless to say he likes kitefishing. 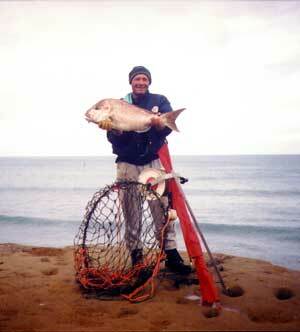 The big landing net in the photo is what I made specially to land the huge snapper often caught from the cliff top. The only way to land the fish from the ledge where we fish is to lie on our stomachs, lower the net down under the fish and try and scoop them in. Chris Bell with a nice 16 pound snapper, which is his personal best. Here are some photos of Peter Berry's catch at Uretiti on Sunday August 11th. He is renown for being "tinny" but he is also a good fisherman. He spent from 6am to 6pm at the beach doing several sets over the day. His perseverance paid off, and sooner of later it was dinnertime for a few hungry snapper. Pete's gear came up to a reef and stopped. Letting it fish there for about 45 minutes he pulled in a couple of snapper up to 2.5kg. A further set was launched and several more snapper and one gurnard came in. Pete used squid and mullet baits alternately, the fish were caught on squid. The biggest snapper tipped the scales at 7lb . The tide was 3/4 out on his best set of the day. Pete got a total of eight snapper and one gurnard. Nice fish, nice dinner and plenty of wind straight offshore. Another tale - I hear a few blokes at Waipu had a gurnard fishing contest targeting that species and that's exactly what they got. All gurnard, there was a total absence of snapper. Boaties out of Whangarei fishing by Three Mile Reef are getting tarakihi according to Radio Northland's man Vern from Oakura Bait & Tackle. My partner Mark went out for a couple of hours on Saturday morning and set the Boat Longline before throwing a line over the side with the rod. He caught four gurnard and four kahawai. The gurnard are such good sized fish, most weighing between 1.0kg and 1.5kg. The big kahawai are still in the upper harbour. These fish are the biggest kahawai I have seen for years. Most are in very good condition. All the kahawai had big roes in them so they may have come into the harbour to spawn. I was interested to see one of the kahawai had a whole gurnard in its guts, which it must have eaten just before taking the bait. All the gurnard had been feeding on crabs. We have been using mullet for bait when targetting the gurnard and the kahawai are a bonus. With the weather improving and the excellent fishing opportunities almost upon us it is a good time to check your gear. Check your knots, crimps, joins and line. Historically September is the time when the big fish start coming in, so make sure your gear is up to handling the big fish by doing your maintenance at home, before you go fishing. The big snapper are about to come down the coast so you want to be sure your gear is capable of hauling in these fish. Check out the following article for information on maintaining and repairing your mainline. We need your fishing reports to make this newsletter interesting. If you go fishing, let us know how it went. Any information about your kitefishing, surfcasting, boat, kayak or kontiki experience is welcome. If you have information to add to our database see our Beach Report page to add your data. Please include your name, where and when you were fishing, rig or method you use, wind conditions, bait and what you caught. It is also important to know where the fish are not biting so even if you catch little or nothing send the report in. This helps everyone maximise their fishing time and makes it that much more enjoyable for all of us.